With an emphasis on growing Nebraska, Gov. 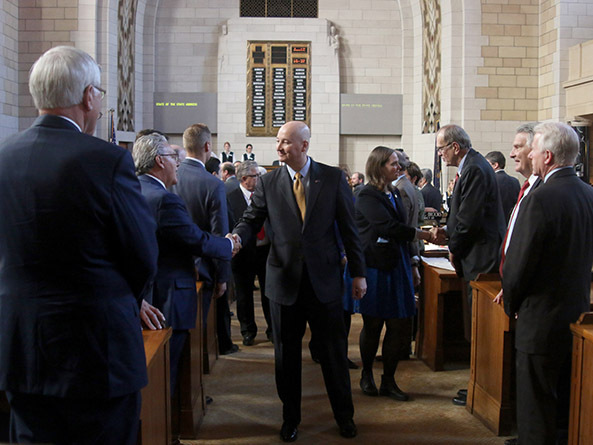 Pete Ricketts proposed providing property and income tax relief, increasing government efficiency and easing burdensome regulations in his State of the State address to lawmakers Jan. 12. Ricketts said controlled spending and lower taxes would help grow the state’s economy. The governor applauded state agencies like the Department of Health and Human Services and Department of Labor for implementing efficiencies that resulted in more than $34 million in combined savings to taxpayers. He also called for continued easing of regulatory burdens that hamper job growth, such as unnecessary licensure requirements. The most important step in attracting new people and businesses to the state, however, is to address the state’s $900 million budget deficit by controlling state spending, he said. Reductions in state revenue have led to the current deficit as farm income has decreased from $7.5 billion to $4 billion over the last several years. Ricketts encouraged lawmakers to advocate for citizens and called for a restrained 1.7 percent average increase in spending. The governor recommended that senators balance the upcoming budget by addressing the revenue gap without increasing taxes, reduce government expenditures and maintain a cash reserve of $500 million to adequately address future economic uncertainty. “Raiding the property tax credit relief fund, raising sales taxes and taxing food and groceries would all harm Nebraska families and be bad for our economy,” Ricketts said. Despite the decrease in state revenue, senators must continue to fund state priorities, he said. The governor’s budget recommendation includes a 2.7 percent average annual increase to K-12 education and an additional 3 percent increase in special education funding. Ricketts said despite significant progress made in addressing problems at the state Department of Correctional Services, further work and funding is required. His budget proposal would reduce protective services vacancy rates, upgrade technology and improve the Lincoln Correctional Center. In addition to providing for the basic needs of more than 5,300 inmates, the governor said the department has successfully implemented programs that improved the quality of life for inmates as well as correctional officers. Finally, Ricketts called for broad property and income tax relief that would ease financial burdens on taxpayers and spur economic growth for the state. The governor urged lawmakers to address the rapid increase in property taxes paid by farmers and ranchers. He said property taxes rose 137 percent on agricultural land between 2003 and 2013, despite declining cattle and crop prices. Ricketts called for a new, income potential-based property tax assessment method for agricultural land, which he said was a fairer measure and would slow the growth of agricultural land valuation increases. 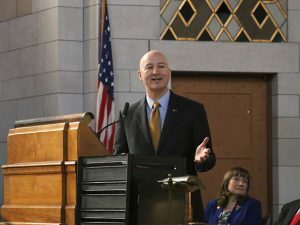 Ricketts also said a decrease in the state’s highest income tax bracket was overdue and proposed a one-tenth of 1 percent reduction annually, starting in 2020, as long as revenue growth exceeds 3.5 percent. If revenue does not grow, the tax rate would not decrease. Ricketts said concerns about other states’ efforts to cut taxes in an economic downturn did not apply to his proposal. He said Nebraska would prioritize restrained spending followed by tax relief. Helping middle class families would in turn help the state’s economy.